The NOAA Climate Prediction Center released new seasonal outlooks on Thursday of this week (Feb 18). The ensemble forecast of monthly anomalies favors a warmer than normal spring for Minnesota, March through May. The confidence or probability for this forecast is close to 70 percent. An early spring seems relatively assured. The outlook for precipitation anomalies over March through May is less certain for Minnesota with equal chances of above or below normal values for much of the state, and slightly favoring drier than normal conditions this spring in northern counties. Many northern Minnesota observers reported sub-zero temperatures last Sunday on Valentine's Day (Feb 14). Embarrass, Minnesota reported a second consecutive morning low of -36°F tying Cotton, MN (January 12, 2016) for the coldest reading in the state this winter. Tower and Orr both reported -31°F on Valentine's Day, while Gunflint lake reported -27°F. Minnesota has reported the coldest temperatures in the nation on four dates so far this month. These include -33°F at Cotton on February 10th, -35°F at Cotton on February 11th, a-36°F at Embarrass on February 13th, and -28°F at Embarrass on February 17th. The reading of -36°F at Embarrass on Valentine's Day was not the coldest in the nation, that distinction belonged to Mt Washington, New Hampshire with a reading of -40°F. Recently Minnesota Public Radio (MPR) announced its full complement of meteorologists to help in covering the weather on their region-wide broadcast network. I was not the only one impressed by this. Paul Huttner is now teamed with Bill Endersen, Rob Koch, and Ron Trenda to cover weather for MPR and this represents well over 115 years of meteorological experience, mostly in Minnesota's environment. No other news organizations can boast this much experience. For this MPR should be proud! We are well served when it comes to covering the weather, especially when significant or threatening conditions present themselves. The United Kingdom Met Office has signed a contract to provide weather forecasts for the safe construction of two German built wind farms in the North Sea. One proposed wind farm will consist of 54 turbines and produce 332MW of power, while the other will consist of 67 turbines and produce 402MW of power. These wind farms are supposed to be completed in the spring of 2017 and will be some of the biggest in the world. The Southern Hemisphere oceans are hosting two strong tropical cyclones (TC) this week. Long –lived and very large (over 40 mile radius of hurricane force winds)TC Winston is spinning in the Southern Pacific Ocean south of Pago Pago and east of Fiji. It was generating waves over 40 feet high and winds over 140 mph. TC Winston was expected to bring heavy rains and high seas to portions of Fiji this weekend. TC Uriah was spinning in the Southern Indian Ocean far from any islands. It was producing sea waves of 20-30 feet and winds up to 90 mph. Uriah was expected to dissipate by Sunday without any consequence to inhabited islands. 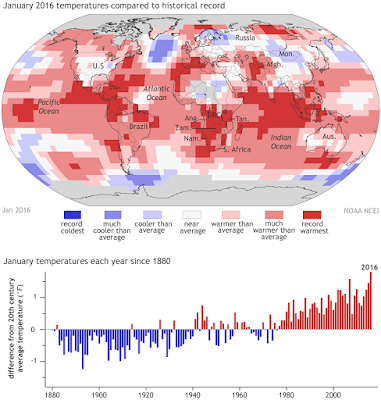 NOAA issued an update on global January 2016 temperature anomalies this week, "The planet has been on a hot streak recently. NOAAs National Centers for Environmental Information reported earlier today that January 2016 became the ninth month in a row to set a new record-warmest monthly temperature." 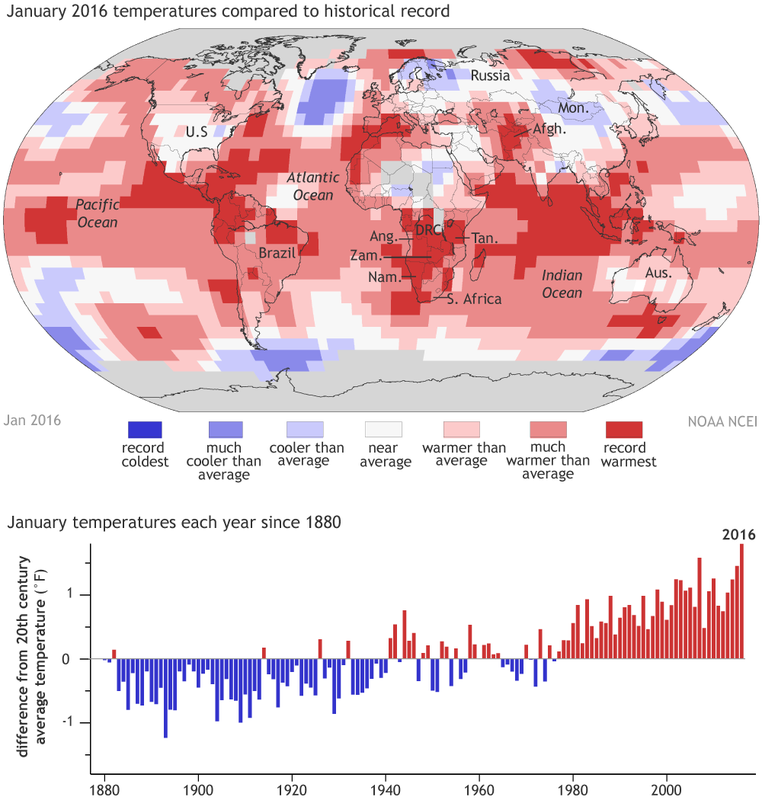 They also note that the global mean January temperature has not been cooler than normal since 1976. The National Stormwater Calculator is now available for use online. It is a tool to assess the annual amount of rainwater and frequency of runoff from specific locations anywhere in the USA. It also includes a feature to explore the impacts of climate change. This tool is designed to be used by anyone interested in reducing runoff from a property, including site developers, landscape architects, urban planners, and homeowners. Researchers with the National Science Foundation (NSF) and NOAA-National Center for Atmospheric Research (NCAR) issued results of study earlier this month that reveals why the desert southwest of the USA is drifting toward a drier and drier climate. Some areas of Arizona have seen 21 consecutive years of drought. There are subtle shifts in climate features that are leading to less annual rainfall there. With continued climate change this shift is likely to be permanent. You can read more about this at the Science Daily web site. We've had only one -20°F temperature reading in the Twin Cities since 2010. It seems like back in the day, we'd get a -20°F reading at least once during a winter more often than not. How long has it been historically since we've had a stretch like this in which the temperature so consistently refuses to get to -20°F? The last occurrence of such temperature values at MSP Airport was just before midnight on January 5, 2014 when the thermometer touched -20°F and then at 530 am the next day on January 6, 2014 when the thermometer touched -23°F. The previous last -20°F readings was January 16, 2009 (-22°F), 1814 days earlier. This was not the longest stretch between temperatures of -20°F or colder in the MSP climate record. There are two longer stretches: January 10, 1999 to January 29, 2004, 1846 days: and December 12, 1955 to January 23, 1961, 1862 days. For contrast the winters of 1960-1961 through 1974-1975, sixteen consecutive winters, delivered low temperatures of -20°F or colder to the Twin Cities. Conversely Since the winter of 1999-2000 only 3 winters have brought such temperatures to the Twin Cities (2003-2004, 2008-2009, and 2013-2014). This is strong evidence for the disappearance of tradition winter in our Twin Cities climate. The average MSP high temperature for this date is 30 degrees F (plus or minus 12 degrees F standard deviation), while the average low is 14 degrees F (plus or minus 14 degrees F standard deviation). MSP weather records for this date include: highest daily maximum temperature of 57 degrees F in 1981; lowest daily maximum temperature of -3 degrees F in 1929: lowest daily minimum temperature is -20 degrees F in 1929 and 1941; highest daily minimum temperature of 40°F in 1930; record precipitation of 0.72 inches 1952; and record snowfall of 8.3 inches also in 1952. Average dew point for February 19th is 12 degrees F, with a maximum of 46 degrees F in 1930 and a minimum of -31 degrees F in 1941. The state record high temperature for this date is 68 degrees F at Winona (Winona County) in 1981. The state record low temperature for this date is -52 degrees F at Baudette (Lake of the Woods County) in 1966. State record precipitation for this date is 2.50 inches at Montevideo (Chippewa County) in 1984; and record snowfall is 23.0 inches at Luverne (Rock County) in 1962. A slow moving winter storm brought heavy snowfall to many parts of the state over February 17-20, 1952. Many observers in western and central Minnesota reported over 20 inches of snowfall. Marshall reported over 30 inches. Many schools were closed and some central Minnesota highways were closed for a time. Seven deaths were blamed on the storm. Arctic Cold gripped the state over February 16-23, 1966, bringing sub-zero temperature readings to almost every corner of Minnesota. The "warmest" spot in the state was Fairmont with a reading of -10F. Record-setting cold temperatures were common on February 19th with over 40 communities reporting morning lows of -30F or colder. The daytime high at Argyle in the Red River Valley was -18F. Snow depths ranged from 3 inches along the Iowa border to over 3 feet at Bigfork (Itasca County). February 19, 1979 was one of the few dates in history that Lake Superior was completely ice covered. The winter of 1978-1979 was one of the harshest in history for the Great Lakes Region. A 5-day spell of record-setting warm weather prevailed across Minnesota over February 16-20, 1981. Temperatures reached the 50s F as far north as Baudette and Gunflint Lake, while the 60s F were common in western and southern Minnesota communities. February 19th that year was by far the warmest in state history with over 90 weather observers reporting afternoon high temperatures in the 50s F under brought sunny skies. In southwestern Minnesota farmers were seen planting small grains. A strong winter storm brought a mixture of rain, freezing rain, sleet, and snow to south-central and southwestern Minnesota counties over February 18-19, 1984. Many observers reported from 5 to 12 inches of snowfall. Luverne (Rock County) reported 13 inches of snow. Winds from 30-40 mph blew the snow into 10 to 15 foot drifts closing many roads for a time. The thick coating of ice on power lines caused widespread power outages. Warmer than normal temperatures will prevail this weekend, with increasing chances for some rain or snow showers late Saturday and into Sunday. Moderating temperatures next week, but mostly warmer than normal, and generally a dry week ahead.